Once you start growing mint, it's difficult to stop. It's the most invasive plant - it sends out runners from its roots and so can take over the whole garden if you let it. 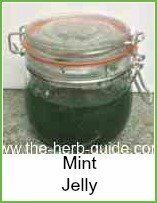 I find the best way of growing mint is to sink the plant in a large flower pot within the herb section of my garden and then every so often - during the summer about once a month - lift the pot so as to detach the root from the surrounding soil. That way, the runners never really have chance to grow outside the pot. Another idea is to surround the planting hole with plastic or metal sheets so that it is truly confined to one area. 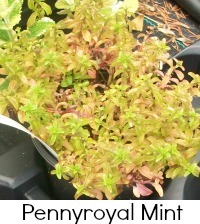 I saw a photo the other day of mint planted in a washing machine drum - what a great idea! 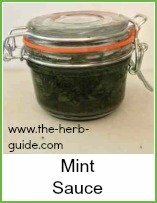 Mint is an essential in your herb garden though - it's the taste of summer - mint on your potatoes and peas, chopped into yoghurt as a salad dressing, garnish for cool drinks and of course, in sauce or jelly to accompany lamb. There are over 600 varieties. 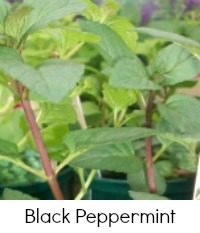 The most popular for kitchen use is spearmint and peppermint is the medicinal herb. 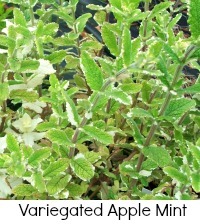 You will find dozens of different varieties on sale in most nurseries. But ‘spicata’ is spearmint and ‘piperita’ is peppermint. 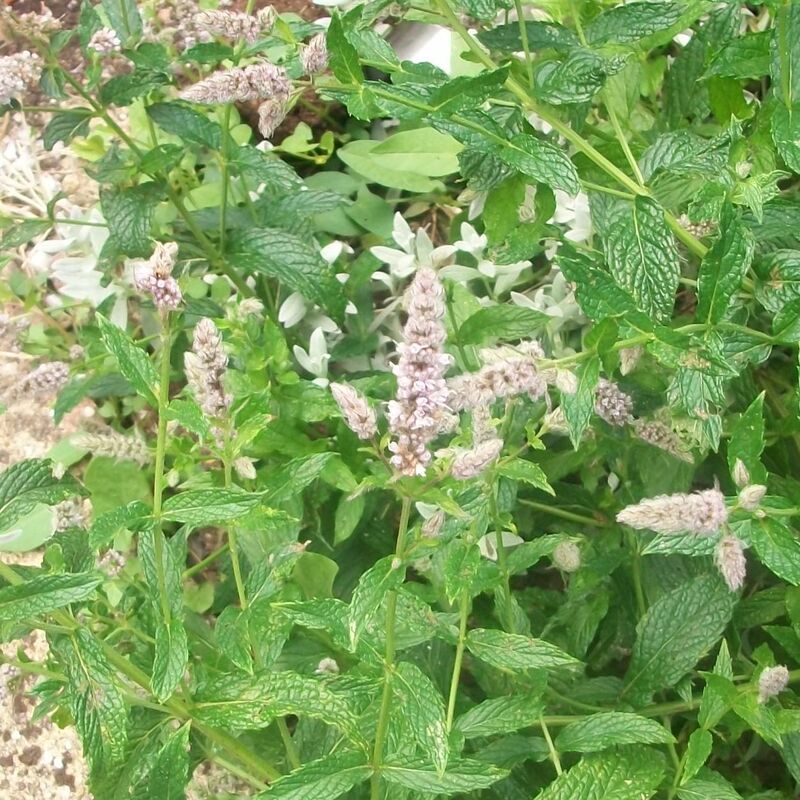 ‘pulegium’ is pennyroyal and should be avoided by pregnant women. 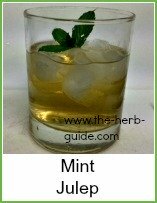 Avoid essential oils and medicinal quantities of mint until baby is safely born. Smelling the oil is OK - it can help relieve the nausea associated with morning sickness. Culinary quantities of mint are safe and will not harm a viable foetus. Beg a runner from a friend or buy a small plant in the spring, once the risk of frost has passed. Avoid a very heavy soil - make sure that the soil is well dug and if it is heavy, then mix in some bark chippings or pea gravel. If you follow my advice of planting in a pot though - just use some good quality potting compost - don't let it dry out too much and feed once or twice a year after the first season - unless you divide the mint and then repot in fresh compost. It will grow virtually anywhere, but if it's in too much shade, it gets 'leggy' - a lot of space between leaves. That doesn't affect the taste of it, as it's the leaves you'll be using anyway - just the appearance. 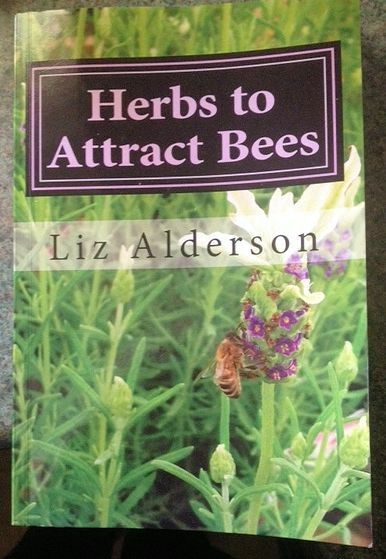 In fact, the essential oils will be less damaged for having less direct sunlight on them. 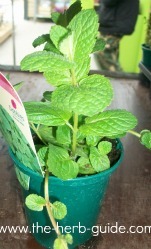 Pot up a plant in the spring - use a 4 inch (10cm) pot of good compost. This way, you will have lots of stems for winter use - the cutting back will make other stems shoot up and stop the flowers growing. The growth of the flowers signals the end of the season for the mint plant - so this one should keep going until it's allowed to flower. Bring this plant indoors in the late summer for the winter. The following spring, after the risk of frost has passed, put it out in the garden. It may or may not survive this intensive growing - mint is supposed to die down in the winter to replenish its root system - however, if you replant this one in the garden and let it have a season doing what comes naturally :-) it will probably be OK.
Take another few runners in the early spring to plant up as before for use the next winter and you'll have a constant supply of mint. 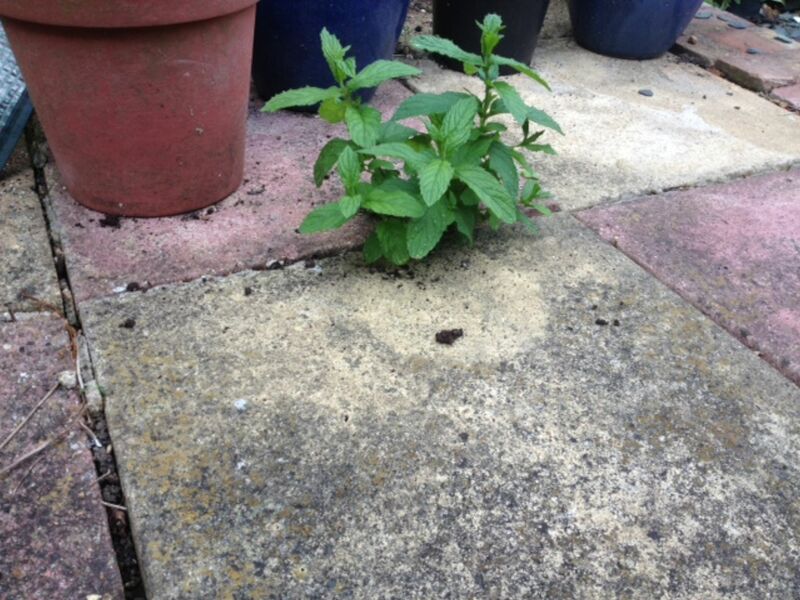 In my current house, I am invaded by mint from next door's garden - no matter how I try to control, it creeps under the stones and patio into my garden - springing up everywhere. You can see what I mean in the photo above. I don't mind too much - just pull up the bits where I don't want them! Your mint might be suffering from rust spot if it's been neglected - that's an orangey fungal growth on the stems and leaves. You will need to cut these stems away as they will infect others. If this is done in early summer, and the plant is kept well watered and weeded, there's no reason why it shouldn't sprout again and make enough leaves for cutting by late summer. Rust is only supposed to affect the stems and leaves and there is no evidence that the underground roots are affected. 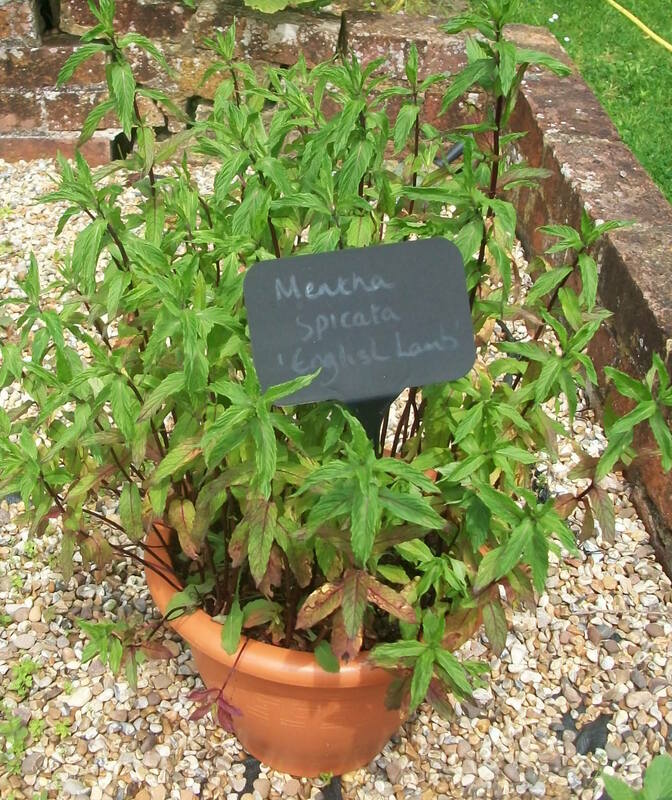 Some gardeners will burn straw on the dead stems in the winter as this is supposed to kill off any spores - it certainly won't hurt the mint, but if it's growing near other herbs, it might not be a good idea! If you've got a rampant bed of growing mint, then you need to decide where you want it to grow and how much of it you want - then, you and the mint will reach a compromise ;-) By that I mean, that you will do your level best to 'contain' the mint where you want it and it will do its level best to break free from that confinement! Dig the weeds out thoroughly and if the plants are totally out of control, dig up as much as you can. Discard the black/brown bits and just keep the very best pieces to replant in containers or lined planting holes. Keep well watered and weeded, and you will be rewarded with a lucious bed of prime quality culinary mint. 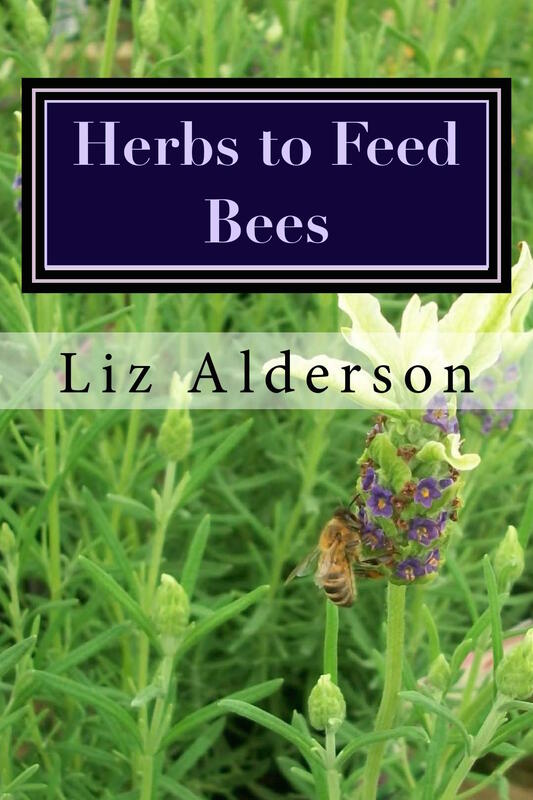 When mint flowers, it's an exceptionally good bee plant - they love the pollen. 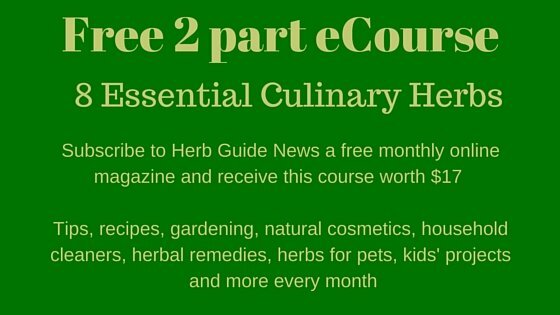 Mint Issue of The Herb Magazine or another page?